Hello gais, just come back home from One Beh. So me and dad decided that we gonna watch the NYSM2 to celebrate Father Day or the last week of ketandusan fulus. Both seems legit. Okay, stop babbling about the poster. Oh ya the movie. I like this kind of satisfactions the movie gives. The elaboration of the story, how the story leads, the strong of the character and all of it worth to watch till the end. 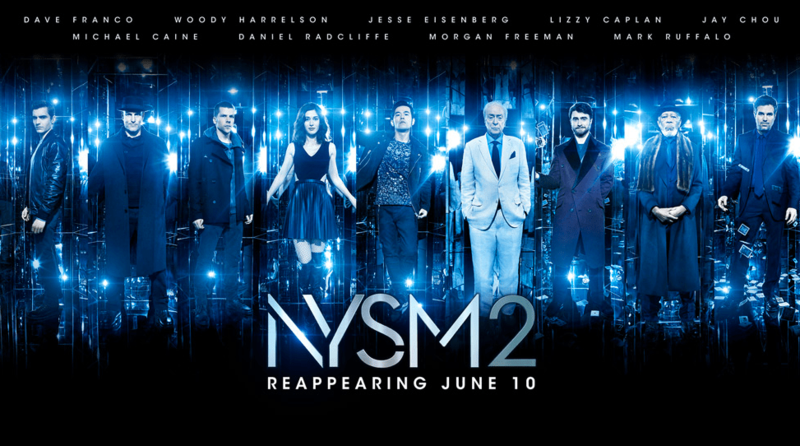 Like NYSM first sequel this time it shows more magic trick and I assure you will not gonna be disappointing by the magic trick and how it be done and not to be mentioned the mastermind and the leader are actually very cool. Addition of the cute Lula May in the team adding feminine value to the rest of the horsemen, shes not like any other girl. Yeah, shes a horsegirl. The story of brotherhood-enemy, father and son relationship, leadership, untold stories, undercover horseman team adding the spice of love-that-come-in-many-ways in the movie. Not to mentioned new love bird thingy. Kebetulan dengan cerita Avanger The Civil War, NYSM2 is a movie told to test bonding of each horseman, how they focus with their job, how obey they are to they leader and the ‘as-long-as-we-have-each-other values’. Only to know that in the end they are still a team member. I recommend you to watch the movie cause its really have a nice story line and a great movies to enjoy while we away from our work. Out of 10, I’ll give 8. Cause I love magic trick and how it can be done, in any possible way.